Fresh broccoli is best consumed when still young because as broccoli matures, sugar is converted into a fibre called lignin. Lignin is found in woody stems and cannot be softened by cooking. Don’t buy over-matured broccoli because it will be tough, woody, with a strong cabbagy odour. The stalks attached to florets should be slender and crisp with a clean snap. The leaves should not appear wilted or show signs of turning yellow. The florets should be tightly closed and uniformly green. Yellowing florets are a bad sign. Look for dark green, purplish or bluish florets because they have more beta carotene and vitamin C than paler florets. 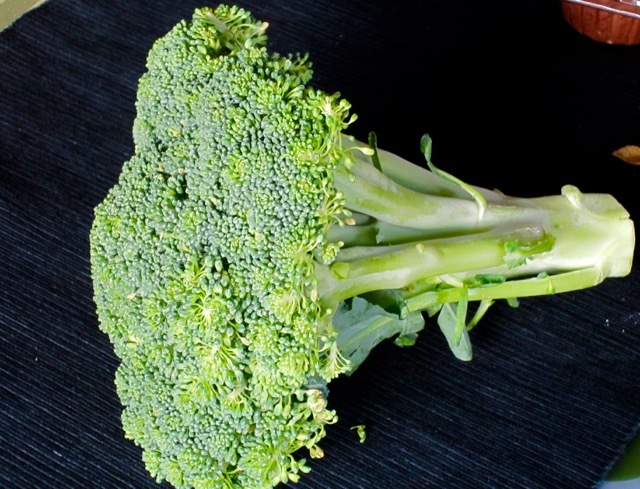 Avoid broccoli with slippery spots on the florets or with brown or slimy stalk bottoms. Avoid buying broccoli with a very strong smell. This suggests it has been lying there for too long. After buying the broccoli don’t store it for too long because it will develop lignin and become woody and unpleasant. A bunch of 800g-1kg (1½-2Ib) yields about 500g (1Ib) florets when trimmed. I like that the stalks can be cut in strips and added to salads and the stalks can be cut in cross section and boiled or steamed and eaten too. That is the best part of broccoli. Provides all the fibre you need!